On Saturday, July 3, 1909, a church in Cambridge, Massachusetts, was having a Fourth of July celebration fair. Part of the festivities included a balloon ascension scheduled for later in the day. 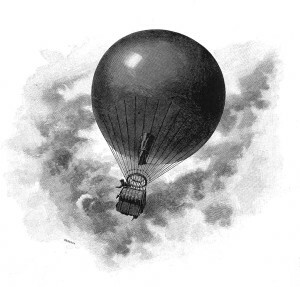 At the appointed time, aeronaut Joseph J. Cannon, 37, took off in his balloon and drifted across the Charles River and over the Boston Common. It was there the hot air in the balloon suddenly began to cool down causing an uncontrolled loss of altitude. The craft came down between two tall business buildings at the corner of Washington and Milk Streets. (These buildings no longer exist.) The balloon’s netting became caught, leaving Cannon suspended over the narrow alleyway that ran between the two buildings. He was rescued, unhurt, by members of the Boston Fire Department.